When asked to name my favourite authors, it often leads to raised eyebrows when I list Stephen King in the mix. Most people immediately think of King as a horror-story author and indeed over the years there have been some memorable contributions to this genre. Early examples are Carrie (1974) and The Shining (1977), which both made very successful adaptions into film. But for me there is so much more to King. He has covered a lot of literary ground in a career spanning over fifty years; science fiction, supernatural fiction, dark fantasy, crime fiction, suspense and thrillers. It is often overlooked that King’s novella, Rita Hayworth and Shawshank Redemption (1982) was the basis for the film The Shawshank Redemption (1994), widely regarded as one of the greatest films of all time. 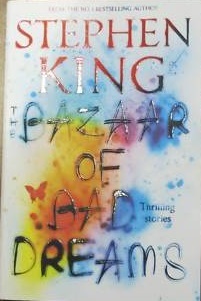 Each of the 20 short stories and poems in The Bazaar of Bad Dreams is a gem for avid fans, demonstrating the depth of imagination and creativity so characteristic of King- with a liberal sprinkling of macabre humour thrown in for good measure. An interesting addition was an introduction to each story by King, a delightful treat for the “Constant Reader”. I particularly enjoyed the contemporary stories such as Ur where Wesley Smith, an old-fashioned English teacher, experiences “new technology” by purchasing a Kindle only to discover it has the extraordinary ability of foreseeing the future. Should he use the knowledge he gains to avert a disaster or will dabbling with the timeline have consequences? Another stand-out story is Obits, in which newly qualified journalist, Michael Anderson, gets a job as the obituary writer for an online newspaper. When denied a pay rise, Anderson writes a fake obituary about his boss which mysteriously comes true. With such power in his hands Anderson realises he can rid the world of evil people, but is that a step too far? With over 50 novels and nearly 200 short stories published to date, King is a multi-award-winning contemporary author, a master of his craft. This thrilling new collection will not disappoint.